Are you looking for an easy side dish for family dinner? 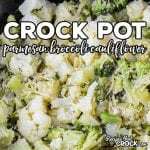 Our Crock Pot Parmesan Broccoli Cauliflower Recipe is a simple side dish with a lot of flavor. Top with butter, garlic, onion and parsley and toss to combine. Cook on high for 2 hrs to 3 hrs, stirring occasionally until veggies are desired tenderness. *See note about cooking times. Add Parmesan and stir before serving.